I don’t know about you but I simply can not function in clutter! I am far from a neat freak but I pride myself on keeping a tidy house where everything has its place and when things are used they are returned to their rightful places. Well how many of you know that life happens? One week is just a little bit busier than the next. It had me thinking how those very same words sparked remarkable changes to occur in my life in years passed. My life was so out of order! I was failing at moving past a relationship that simply destroyed my heart. The pain was more than emotional; it took a toll on me physically. I couldn’t seem to get it together and when I tried to open up I would find myself getting involved with all the wrong people. It was one toxic relationship after another which all led to a dead end. I was drinking without any conviction and completely comfortable with knowing that it was only “social drinking.” All the while, I’m in church praying for God to increase me. I’m praying for God to take the pain away… asking him to show me a way to move past all of the dumb decisions I’ve made. Then I’m sitting in church and my pastor calls me out big time! No he never mentioned my name but it felt like he knew my story and his lesson was just for me! He says, “Our God is a God of order and he is not obligated to move in our lives when it is not reflective of the order of God. Some of you just need to walk around with an ‘Out of Order’ sign on your foreheads!” Ouch! Really pastor?! Did you have to go that hard on me?! I left church that day determined to get things in proper order because I was tired of feeling the way I did. I just wanted to be happy! Now let’s be clear that it was and continues to be a process. Just how my house became cluttered with just one misplaced outfit, that’s how our lives begin to unravel. One bad decision leads to another bad decision… one wrong turn can lead to multiple wrong turns if you don’t have an ear to hear from God so He can direct your path. I had to walk away from a relationship that required me to continually defend my walk with God. I had to stop hanging out with certain people, stop visiting certain spots, and cut out the heavy drinking. I didn’t date for several months because I was focused on getting myself in order so I didn’t repeat the same dumb decisions. Yeah, I was definitely walking around with an “Out of Order” sign on my forehead. The transformation didn’t happen overnight, but no matter how much I messed up I continued to go to church, seeking the Word of God so that I had the ammunition to fight off those moments of self pity. I’m not where I want to be, but I’m far from where I was and I have only God to thank. If you don’t take anything else from my story, I hope you take this… Don’t become complacent or comfortable with living in mess. God is not obligated to move on your behalf if your life is not lining up with the order of God. Things will not change in a blink of an eye. Be willing to seek His voice on the decisions you make so that you aren’t left with a huge mess to clean up later. Life without God is HARD! Just like cleaning up a sea of misplaced clothes is way more time consuming than simply hanging up a shirt after you wash it. 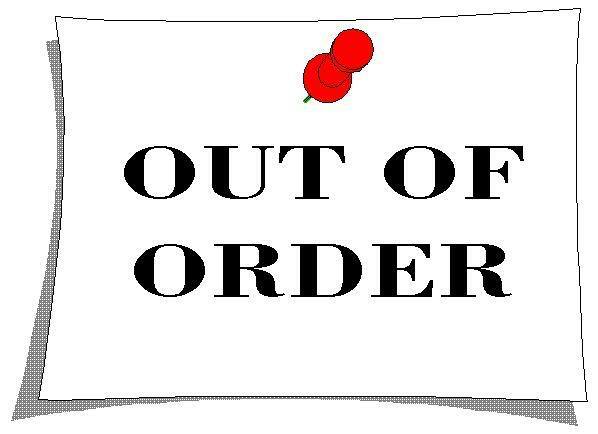 Some of you need to walk around with your own “Out of Order” sign for a little while. It’s okay to deal with YOU. Stop blaming everyone else, including God. Start getting yourself in order now so that God can give you the desires of your heart. My pastor puts it best when he says, “Life is choice driven. We live and die by the choices we make.” Make the decision to live a life ordered by God and you’ll save yourself from years of cleaning up a ton of mess!! This post actually convicted me today; thinking about how many times I avoid company b/c I’m too busy to clean up. If Christ knocked on my door, would I be to ashamed to let him in? “Sorry Jesus…not today, it’s a mess up in here.” With all he has provided me, I need to AND WILL do better. Thank you for your candor and transparency. Love my Bold & Fab sister!! Thanks for commenting sis! Glad it spoke to you. I will do better too! WOW!!! Thank you for this…I needed to hear this! I’m trying so hard to get this “Out of Order” sign off my forehead. You don’t even know how this speaks to my life right now. Thanks for this post! I am trying so hard to get this “Out of Order” sign off my forehead. You don’t even know how this speaks to my life right now. Thanks for this post!